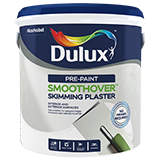 Fixit Smoothover is an easy to use, interior and exterior skimming plaster. Skims up to 5 mm thick without sagging. Adheres strongly to plaster and cement rendering. Sets in 4 hours to a hard finish, resistant to both alkali and weather.